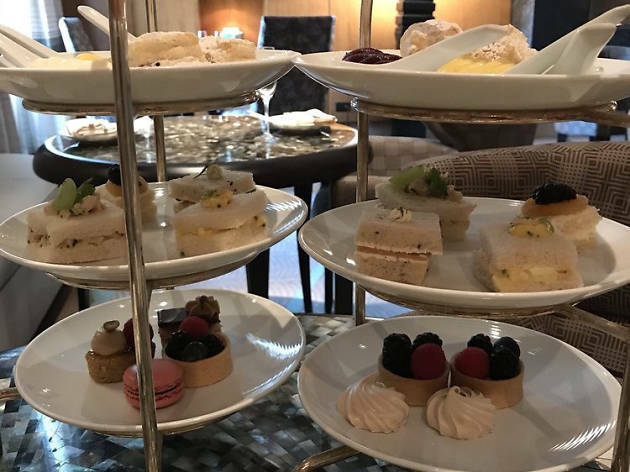 Ironically, Boston—the city that famously ignited a revolution by tipping tea leaves into the harbor—now embraces the fine English tradition of formal afternoon tea service, complete with tiny sandwiches, mini pastries and more. 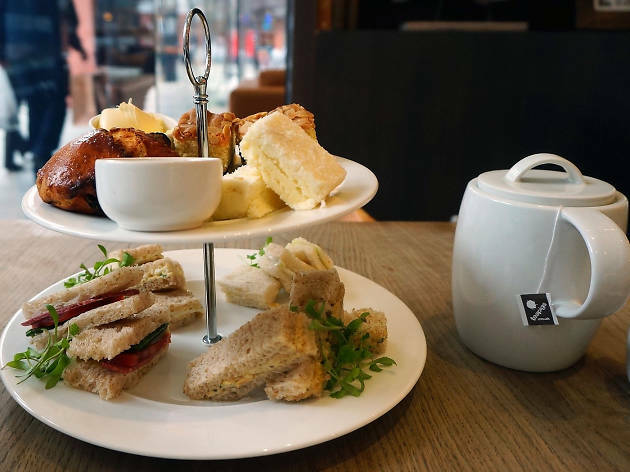 Options include both formal places with afternoon tea service, as well as casual spots offering an excellent cup of tea and pastry. 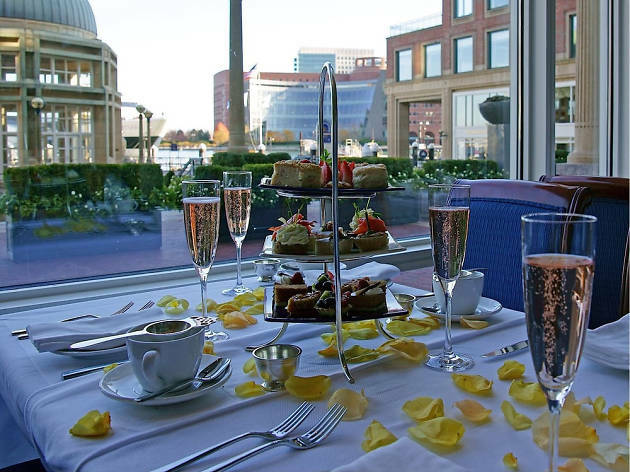 Undoubtedly, afternoon tea pairs nicely with a stroll around one of the best parks in Boston, a day at one of the best places to see art in Boston, or even before catching a film at one of the best movie theaters in Boston. 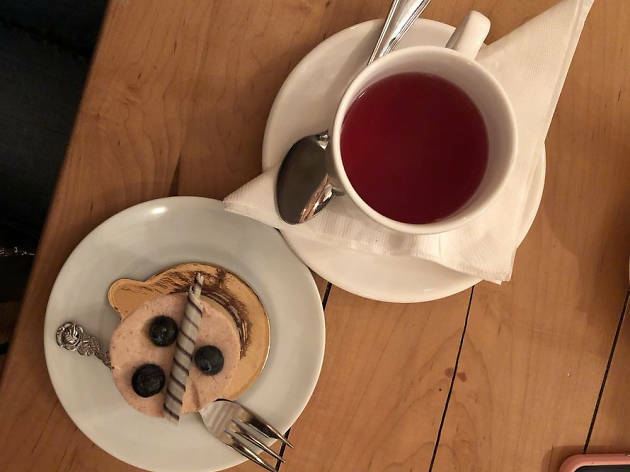 If you’re loyal to coffee over tea, the best coffeeshops in Boston are sure to satisfy, and if you have a sweet tooth, be sure to check out the best hot chocolate in Boston. A jazzy pianist plays peppy tunes and romantic standards at the Langham’s Afternoon Tea with Wedgwood. 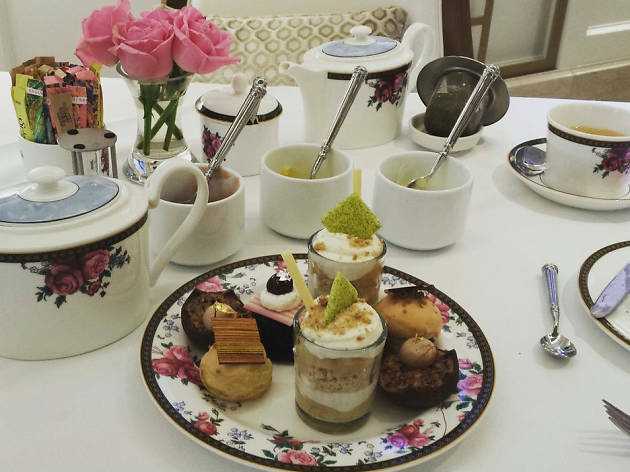 Afternoon tea is served on pretty, rose-patterned china in The Reserve, a gleaming, Art Deco-inspired room clad in blond marble. 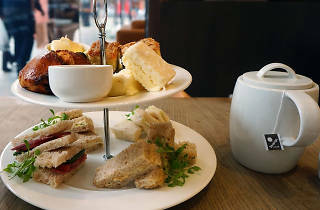 Savories include a less traditional sirloin and mushroom sandwich on granary bread, and de rigeur cucumber sandwiches with chive-infused Gournay cheese. There are dainty, colorful profiteroles, tarts, and cupcakes; add dark chocolate covered strawberries, if you wish. Scones are served with lemon curd, strawberry jam, and clotted cream. 22 teas are available, including the White Blossom, an intoxicating floral blend of white tea with jasmine and rose. Talking of intoxicating, add bubbly or wine for an extra charge. Despite its name, The Dining Room on the second floor is where afternoon tea, and only afternoon tea, is served. Decorated in shades of gold, this pretty room is made more genteel by a classical guitarist playing jazz and other amenable tunes, including Happy Birthday, should it be requested. The three-tired cake stand includes thinly sliced cucumber sandwiches, egg sandwiches, mini quiches, tiny scones with lemon curd, and whipped Devonshire cream (lighter for American tastes). Also available: teeny cupcakes, petit fours, and chocolate-covered strawberries stamped with the Taj name in gold. Choose from 29 different superb teas, from black and white to green and herbal. Add tea cocktails like local Bully Boy vodka with green tea, elderflower liqueur and bitters. Afternoon tea at the Mandarin Oriental is taken at tables in the lobby lounge by the fireplace, with windows looking onto bustling Boylston Street. Tea choices include black, earl grey, jasmine green, herbal, and South African rooibos—but expect tea bags, not loose tea. The cake stand holds three layers of tiny treasures: Scones, sandwiches, and petite pastries. The assortment changes seasonally; for instance, the autumn Harvest Tea includes cranberry scones and pumpkin cream choux buns. Celebratory types kick their afternoon tea up a notch by choosing between a wine toast or bubbles. This afternoon tea comes with one of the best views anywhere: Rowes Wharf Sea Grille is set on the harbor, overlooking the water. Bid city traffic and concerns adieu, while nibbling tartlets, canapés, and petit sandwiches like goat cheese with beet and micro basil on whole wheat bread, or a mini smoked ham and Swiss croque monsieur. 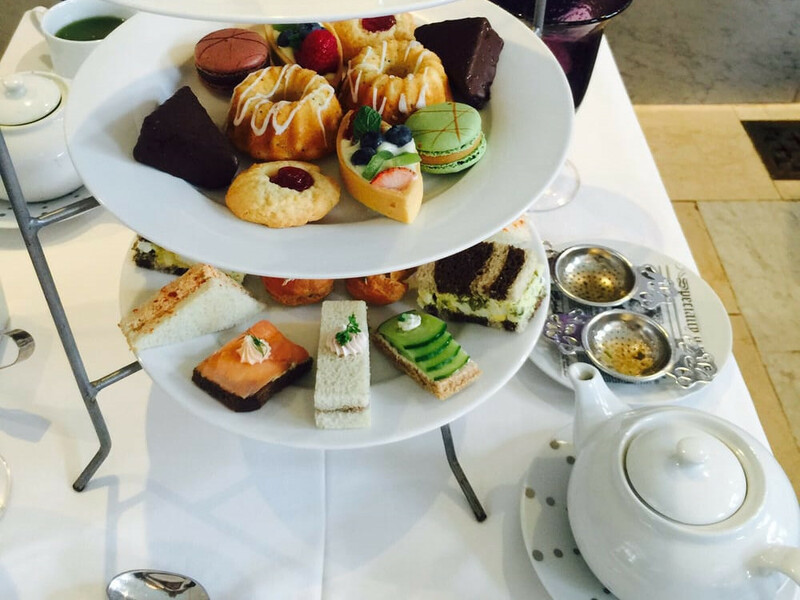 Pastries include scones, cocoa nib teacakes, and fresh fruit tarts, plus mousses, meringues, and macarons. The tea selection is extensive: robust Big Ben English Breakfast, Blue of London Earl Grey, stimulating Sencha Ariake, and delicate Bai Mu Dan. For the connoisseur there are limited edition selections too. Add tea cocktails like the Green Tea Sparkler, which pairs green tea with peach liqueur, peach purée, and prosecco. Or simply add a glass of sparkling rosé. That big smack of irony can’t be denied as Tea is served in Abigail’s Tea Room at the Boston Tea Party Ships & Museum on Fort Point Channel. In fact, the tea blends that were thrown overboard during The Boston Tea Party are served. (The insurgents who tipped the tea in 1773 emptied five different blends into the harbor.) 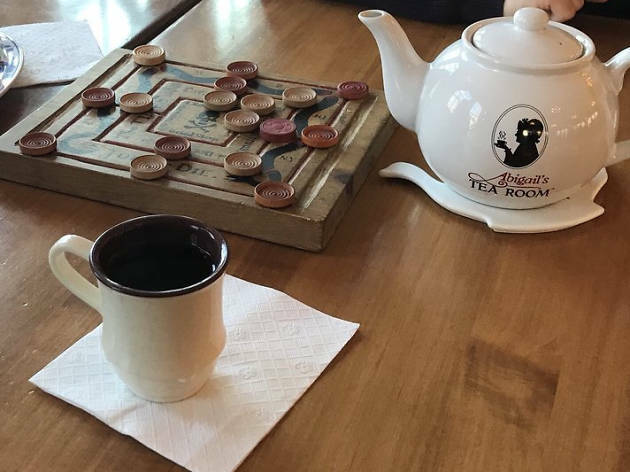 Named after Abigail Adams, wife of the second President of the United Sates, John Adams, the tearoom has beautiful waterside views and you don’t have to buy a museum ticket in order to have a cuppa. There’s an assortment of pastries and baked goods. Abigail’s Tea Platter includes a pot of Abigail’s blended tea and scones. Afternoon tea at this Back Bay fine dining stalwart includes an assortment of tea sandwiches—herb cream cheese with cucumber on citrus brioche, Za’atar chicken salad on wheat—and savories such as deviled eggs topped with luxe Russian Osetra caviar, smoked gouda éclairs, and a game bird terrine. 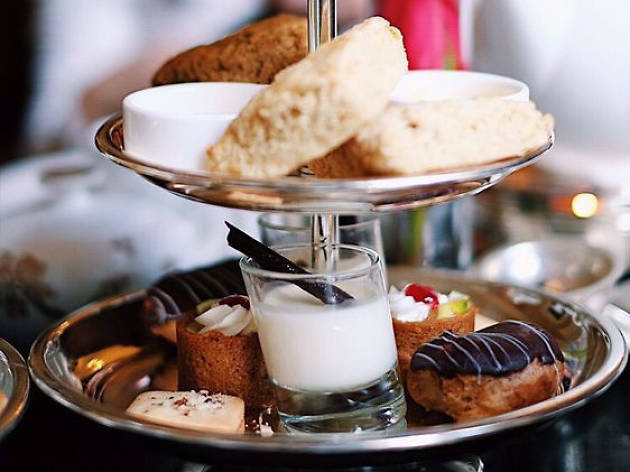 Delicate pastries such as blackberry macarons, sea salt chocolate brownies, swan-shaped vanilla-and-peach choux buns, and lemon scones also impress. All of which holds up to the featured teas, specially blended by a tea sommelier, which range from a simple Taiwanese oolong or English Breakfast to the L’Espalier Anniversary Blend, a black and green tea blend with jasmine, bergamot, and grapefruit peel. Or treat yourself to a Champagne cocktail or the bourbon-based Southern Earl Grey Tea. There is also an afternoon caviar service, plus selections from one of the city’s finest cheese carts. Take a pause for a peaceful afternoon tea retreat right in the heart of busy Boylston Street. The Boston Public Library’s 19th-century original building has an interior garden overlooked by its Courtyard Restaurant. 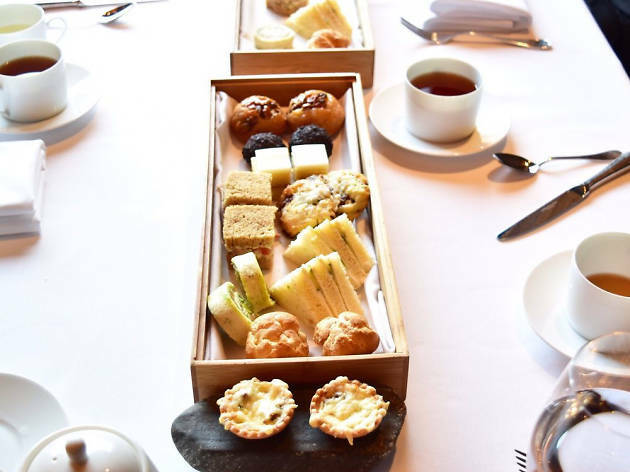 Afternoon tea includes pots of fine loose-leaf teas, which run the gamut from Seeyok Garden Darjeeling and hand-rolled jasmine pearl tea to Bangkok green with lemongrass, ginger and coconut. The cake stand’s three tiers are delightfully laden with tiny, exotic tea sandwiches, fruit scones with thick whipped cream and lemon curd, and pretty tarts and cakes. While this chocolate shop and café is known for its gorgeous cocoa products, fine pots of tea are given just as much attention as the superior hot chocolate. Choose from green, white, or black selections and pair with one of the pretty pastries, all of which are made daily. The fragrant hazelnut-orange cake has a beautiful sweet citrus flavor; the heady chocolate Harvard Square is a square shaped signature indulgence. There is a small selection of plainer pastries, like croissants. And, of course, you would not go amiss if you paired a strong cup of oolong with some of Burdick’s richly flavored bonbons. Few things are more delicious than a good book paired with a steaming pot of tea. Trident has both. Or perhaps you fancy picking up a real magazine to give your phone a rest? 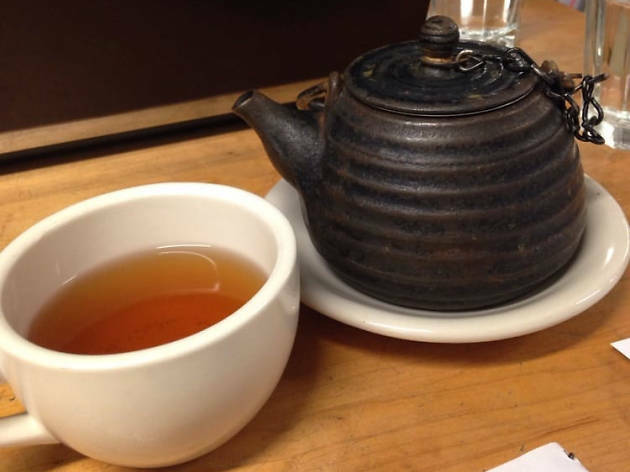 Hang out in this Back Bay bookseller’s café and choose from its excellent, extensive tea selection: treat yourself to the Iron Goddess oolong or Blueflower Earl Grey. Pair with a sandwich or something sweet, or don’t—tea is something to savor by itself sometimes. 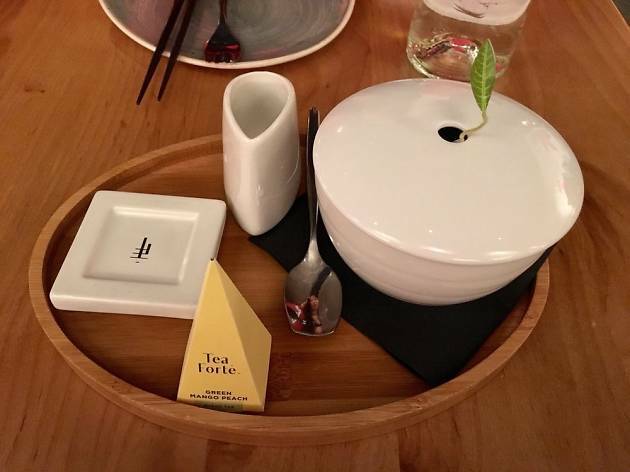 This Hunanese restaurant in Kendall Square features a China-meets-Massachusetts tea program that includes locally blended Tea Forté teas plus Numi organic Yunan black or jasmine green teas. Add something sweet, such as the sweetened rice cakes or the snow fungus and pear soup, and you have a truly exotic tea experience.